I found a new playlist on my Spotify account the other day, called ‘My Shazam Tracks’. Surprise number one was discovering that Shazam and Spotify already know each other. I can’t remember making any introductions. But there they were, together on my phone, probably talking about me behind my back. Surprise number two was finding out exactly what was on ‘My Shazam Tracks’. I’ve used Shazam maybe half a dozen times – in pubs or offices or listening to the radio, hearing a song and wanting to know its name and who it was by. Like everyone else, I suppose. But instead of My Shazam Tracks showing just these few songs, it displayed a list of dozens. The ones I remember Shazamming were there – tracks by Bonobo, Caribou and a John Williams film score. But so too were others so familiar to me I’d never need an app to identify them. Songs by Stevie Wonder, Muddy Waters, Frank Zappa, the Stones… The idea of holding my phone in front of a speaker to find out who was responsible for ‘Gimme Shelter’ or ‘I Say A Little Prayer’ is ridiculous. I’m not even a huge fan of either song, although I won’t skip to the next track if they come on, something I’d definitely do with Iggy Pop’s version of Louie Louie. That’s one of ‘My Shazam Tracks’, apparently. So what’s going on? I asked @SpotifyCares on Twitter and they suggested I contact @Shazam. 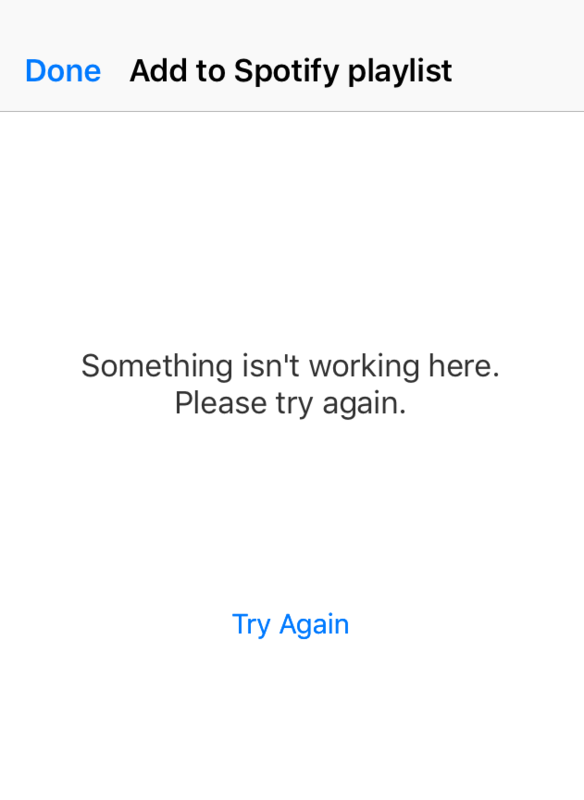 @Shazam were clearly too busy wondering how they were going to spend the $400m that’s about to fall into their lap courtesy of Apple. So it remains a puzzle, and one which today developed another layer of puzzlement. So I can’t physically add tracks that I like to ‘My Shazam Tracks’. Instead, a variety of songs – some good, some less so – is added to the playlist on my behalf by entities unknown. It’s a funny old topsy-turvy world and no mistake. Is it the way I talk? Do I whisper or mumble? Maybe I’ve had a speech impediment all these years without anyone having the courage to tell me. We all know that the voice you hear in your head is different from the one everyone else hears. Or perhaps I’ve been fitted with some sort of reverse Babelfish device that takes everything I say and renders it into Pawnee. “To take away, thanks.” I suppose it’s conceivable that I’d want to eat the croissant there and then but not touch the coffee until I was safely off the premises, but not on this occasion. The barista nods and gets to work. I check my phone for something to do. A moment later I hear her addressing me. “Chocolate?” She’s hovering by the croissants with a paper bag and a pair of tongs. “Plain, please.” Maybe I didn’t say plain. A regular is about two inches of coffee. “You want hot milk?” How on earth does what I said sound like I’m asking for hot milk? “No, cold milk is fine. Could I pour it myself, please?” With guarded hesitation she allows me full control of the milk jug. I add just enough to make the coffee coffee-coloured. “Excuse?” says one of the baristas. “Do you have any lids for the coffee?” I gesture at the lid-less table. “You want a lid?” Yes, I want a sodding lid. Why is this all so hard? He grabs a stack of lids from a shelf behind him and I get ready to place them on the table. 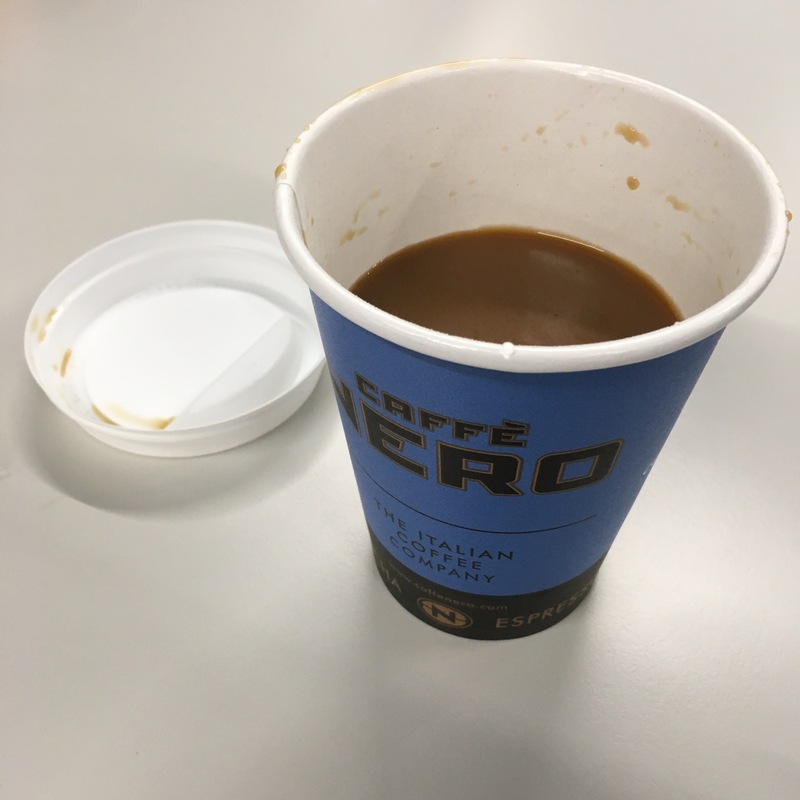 Instead, he prises a single one off to give to me then replaces the other lids back on the shelf, evidently assuming that no other customers will want to protect their coffee from spillages. Although, given the horribly foreshortened state of my ‘regular’, I could have hopped to work without spilling a drop. I was round my mate Geoff’s house the other day. He likes his gadgets, does Geoff. Old gadgety Geoff. When I can next justify it financially, I thought, I’m going to get one of these Sonos systems. Then last week I started noticing their ad campaign. No easy matter, as the adverts are discrete and understated virtually to the point of invisibility. But they got me looking for a stockist in Basingstoke, where I was working at the time, so the campaign worked to that extent. The instore demonstration was pretty compelling. The guy showed me how the remote worked, talked me through the various systems and explained how to get the best out of it. Although my iTunes library probably wouldn’t be up to the job, he cautioned. Why ever not? Well, apparently when you import CDs to iTunes, it rips them at a less than optimal setting. For purposes of speed, I guess. For the least compression and hence the best quality, I would have to import all my CDs again on the Apple Lossless setting. Hmm. Another thing that perplexed me was the set-up of the speaker. I belong to a generation conditioned by everyone from hi-fi mags to the Melody Maker to position speakers six to eight feet apart. That was the way to replicate a live performance and the best way to enjoy any stereo effects created in the studio. Mono? Pah! I thought about the number of times I actually sat down in the precise way recommended by speaker manufacturers and hi-fi buffs and realised that I didn’t any more. Not much, anyway. So the lack of true stereo might not be such a big deal after all. OK, I thought, I’ll take it. Just one problem – that store didn’t have one in stock in my choice of colour. (There are two: Apple white and Apple black.) But their Camberley store did have one. I got them to reserve it and headed back to the office. During the afternoon, doubt started to creep in. £350 is quite a lot to pay for something which would involve me doing days and days worth of ripping. The ‘sound in every room’ sales schtick wasn’t that convincing either when I realised I pretty much had that already. And there was that whole back to mono thing. But on the other hand, the sound was truly amazing and the idea of using that chunky little remote control to summon up music from pretty much anywhere was difficult to resist. So I made a deal with myself. If I get work for next week, I’ll buy it. If not, I won’t. I checked my emails. Yay! I had work for the following week. A couple of days, anyway. So that evening found me in the Camberley hi-fi store, punching my PIN into the terminal and looking lovingly at the box of music that was about to be mine. I checked with the salesman. “It’s got the manual in there, I take it?” Manuals are a waste of paper, he glumly told me. There’ll be a CD-Rom in the box. I nodded. I prefer manuals. This idea that a manufacturing process involving polycarbonates and aluminium and a reading process that required a £500 computer and a semiconductor laser was somehow better than printing a little booklet was unconvincing. That sounded odd. How am I meant to operate it without the remote? He told me it was done via an app on my iPhone, iPad, Android phone or a desktop interface. All very well for me, as I’m never far from my iPad. But Mrs Bravenewmalden doesn’t have any of those things. Well, she’s got a PC but there was no way she, or anyone else for that matter, would be prepared to sit down in front of a computer just to skip ‘Octopus’s Garden’. What the salesman said next brought to a sudden end my brief flirtation with Sonos. “£280.” My jaw made a rich, room-filling sound as it crashed to the floor. No, that wasn’t a mistake. The remote represented 45% of the total cost of the system. Having precious little else to do, I thought about that for a while. The wording of it. (Not, for once, the punctuation or clumsiness of the language.) Normally, an anti-littering message will be along the lines of PLEASE TAKE YOUR LITTER HOME WITH YOU or simply NO LITTERING. This particular sign appeared to be using basic psychology to persuade people not to chuck litter out of their windows. Perhaps it was an example of the nudge theory we’ve been hearing about. Will it work, though? Would the thought that you’re in a shameful minority encourage you not to litter? On the one hand, we like to belong and to conform to certain behaviours. On the other, some of us are utter twats and will remain that way no matter what we read on road signs. Blogger Pete Faint is strongly of the opinion that the signs won’t work. But I’m hoping they have a positive effect, because the motorway and A-road verges that I’ve looked at during traffic delays are in a terrible state. It’s not all the fault of drivers. Lots of ripped plastic sheeting seems to have ended up on roadsides from nearby farms. Crop farmers use huge quantities of the stuff to wrap their bales of hay or corn or whatever, and some of it gets blown away to festoon trees and hedgerows for miles around. But mostly it’s fast food packaging, magazines, sweet wrappers and drinks bottles, right up to bigger stuff like furniture and pallets. Plus puppies in sacks. In any case, how would anyone know if it’s worked or not? We’d only know if they did a split test. Signs would go up along one motorway that’s just been cleared of all litter and along another one that hasn’t. After a year, you look at the results. Instinct tells me that the Highways Agency doesn’t think like that, though. I could be wrong. Incidentally, this guy had a novel approach. It almost sounded like he’d made some sort of point. Without all those Metros to pick up (along with all the paid-for newspapers that are now being left behind on public transport, since the coming of Metro has conferred legitimacy on the dropping of just about anything), the newspaper picker-uppers wouldn’t have a job to do. Well, not THAT job. But using that argument, it would surely be better from an employment perspective if we were all to commit more crimes (extra police and judiciary) and cause more collisions (extra jobs in manufacturing, insurance and auto repair). The other point to bear in mind, and I think it’s a valid one, is that I hate Metro. Especially its laughable claim to be ‘apolitical’. Anyway, what do you think? About the motorway signs? Think they might stand a chance? I’m itching to hear your opinion. My iPhone 3G has been getting very slow recently. It has to think about every action, much like a sluggish PC. Installing the latest operating system didn’t help. In fact I think that was a ruse by Apple to get all iPhone 3 users to upgrade to the latest model. And it worked. 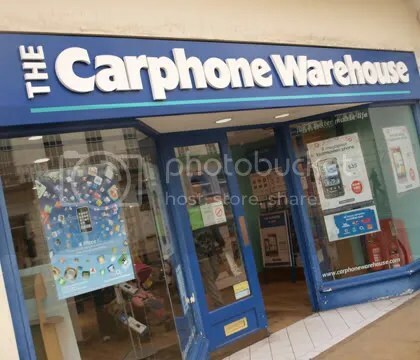 That’s why, a few weeks ago, I found myself stepping into the local Carphone Warehouse. The last time I was there was to buy my current iPhone and to switch networks from T-Mobile to O2. I remember the process being very quick and simple, leaving the store after around an hour clutching my new phone. The phone was great, the network less so. From Canary Wharf to Soho to Clapham Junction, there seemed to be vast swathes of London where the signal was weak or intermittent and where the 3G network may as well not have existed. Hopefully, the combination of a new phone and a new network would provide me with the service I sort of expect for £35 a month. It didn’t start well. Vodafone wanted to see various documents so that they could carry out a credit check. I had my driver’s licence and credit cards and business cards, but they were never going to be enough. The Carphone Warehouse sales guy said I’d need to bring in a bank statement or utility bill. For reasons of expediency, I could email them. So I went home, scanned in my driver’s licence and a bank statement and emailed them to the guy at the address he’d given me. The following weekend I returned to the store, looking forward to start playing with my new phone. You know what’s coming, don’t you? Thing is, I don’t think that straight when I’m cross. Otherwise I’d have asked him why he didn’t email the documents himself. Why he’d used a fax machine. Why, when he learned they’d gone missing, he didn’t simply send them again. Why he didn’t warn me against making a futile trip back to the shop. And why he gave me his hotmail address rather than a ‘guy@carphonewarehouse’ email address. Instead, I made noises about hoping to get a better deal on the rental or the upfront cost as some sort of recompense for all the inconvenience I’d endured, and said I’d return the following week. My third visit. This time, I rang the store before making the schlepp into Kingston. Just to be certain. That was the idea, anyway. In the event it was an utterly pointless precaution as I never managed to get through. My call was important to them, a recorded announcement kept assuring me, though clearly not so important that it would actually be answered. So I got on my bike and headed into K-town. The store was surprisingly devoid of customers. The staff were milling about, chatting to one another. No sign of my guy. The manager was there, though, and he told me that the person I’d been dealing with had the day off. I must admit there was a swear before I walked out of the shop. But like I say, there were hardly any customers there to be offended. So there we have it. A company engaged in the business of communications not answering phone calls. Not liaising with one another. Using fax machines. Encouraging their staff to give out personal email addresses. And one of Britain’s largest companies asking for private data to be transmitted via one of the most public platforms in existence. I’ve packed letters off to both companies saying that they will be held jointly responsible if I become a victim of identity theft and I’ve also alerted the Information Commissioner’s Office. I’ve written this ranty blog. But I still don’t have a new phone, and now I’m not sure what to do next.